Both starting in Guardia Alta, attacker throws mandritto to the head on a right pass, which the opponent parries with the buckler on a left pass. Repeat for fendente, riverso and rising riverso. 5 repetitions each for each cut. Attacker in Guardia Alta, defender in Guardia di Testa. Attacker throws a mandritto on a right pass, which the defenders parries by stepping in with a left pass and intercepting the blow in Guardia di Testa. Repeat for fendente and riverso, with 5 repetitions for each cut. Note that the riverso is thrown from Sopra il Braccio and the rising riverso is thrown from Sotto il Braccio during these drills. Neither of these 2 cuts are described as being thrown from Guardia Alta, so for pedagogy reasons we won’t do so either as it will encourage bad habits. Whereas the parry with the sword last week using the true edge was fairly easy, it has an integral vulnerability, that being the forefinger is exposed to the cut, especially on the earlier simple hilted swords typically used at the start of the 16th century. The parry with the false edge however protects the sword hand behind the cross and is therefore preferred by the Bolognese Swordsmanship authors. The false edge parry is best understood not as a parry but as a counterattack to the opponent’s sword hand or face. By emphasising it as a counterattack, the student will automatically learn to close the line in the parry with an extended arm, which creates a cone of protection with the hilt and forte of the sword. Experience has shown that when students think of the action as a parry they will do so too close to the body and still get hit by the oppponent. For this lesson we are going to practice 2 of the common false edge parries. The first is the transition from Sopra il Braccio to Guardia di Faccia, which will deflect the incoming blow towards our outside. The second is the transition from Guardia Alta to Guardia d’Alicorno. 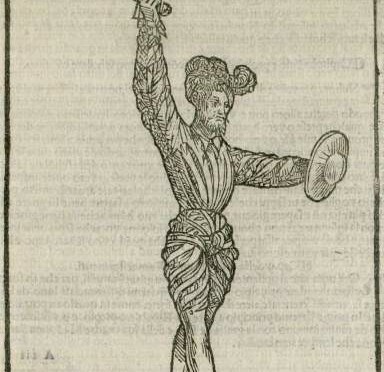 (From Sopra il Braccio) As your enemy passes to your left to cut riverso to your face, cut with the false edge to his right temple, defending the head with your buckler. Attacker starts in Guardia Alta, and defender starts in Sopra il Braccio, sword foot forward. Attacker throws mandritto to the head on a right pass. Defender throws a falso to the right temple or sword hand of the attacker, ending in Guardia di Faccia. The blow should be parried during the transition to Guardia di Faccia, deflecting the blow to the defender’s outside. Repeat 5 times than swap roles. Repeat the sequence but instead using a fendente and then a riverso. The parry generally intercepts the opponent’s sword at the forte with the debole, and cuts up their blade to the tip during the deflection action. This creates a change of direction, forcing the blow to pass over the head to the outside before the blow connects with the defender’s head. The success of the action relies on the turn of the hand, where it translates from palm down to palm up to hit with the false edge. This rotation of the hand accelerates the blade’s motion forward, allowing us to successfully deflect the incoming blade. This is how we manage to intercept the incoming sword, even though we moved second. Don’t think of it as a parry. Think of it as a counterattack to the attacker’s face, and the deflection is a side effect of this action. Attacker and Defender both start in Guardia Alta. The Defender turns their palm outwards, and then flicks the false edge downwards aiming to hit the sword hand on the inside of the sword hand wrist, ending in Guardia d’Alicorno. This can be done stationary (emergency parry) or on a right pass (typical parry). The cut to the wrist will either connect, or create a false edge deflection of the enemy’s sword outside our buckler arm. Like the previous drill, this works best if you think of it as a counterattack to the opponent’s sword hand. The key is to turn the palm to the outside, and then use the forefinger over the cross to whip the back edge down. Passing right is the optimal solution, as this also clears the body off the line of the attack whilst the sword comes into defend. If the false edge parry comes through early, we still have Guardia d’Alicorno to defend ourselves. I am curious why you decided to interpret the actions from Libro 1, Capitolo 3 the way you did. 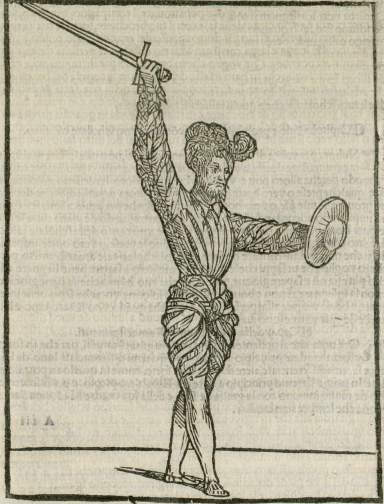 In Tom Leoni’s translation, we do indeed have a riverso being thrown from guardia alta (to the leg), and the falso to the sword hand seems to be a defense after that riverso, so it would be thrown from coda lunga, not guardia alta. Throwing a riverso from guardia alta is definitely not a common action, but there are two more places it might be used. In the second assault, Manciolino tells us to deliver an ascending riverso after a montante-like thrust, and in the third assault, after lifting a falso to guardia alta, he tells us to pass back and get into coda lunga alta. I’ll admit that those examples are grasping at straws, because the montante-like thrust does not necessarily end in guardia alta, and we don’t have to throw a riverso to get to coda lunga. And if the falso should be thrown from guardia alta against his attack to your head, why is it in the section on how to attack him in guardia alta? That seems oddly reactionary when all the rest of the contents on attacking from the guards have you taking the initiative. As for the falso counter, you might be right in your interpretation, and I do teach that variant of the falso parry from the low guard in the next lesson. The version I teach came about as a variation of the imbrocatta from Guardia Alta which uses the same mechanics. When I tried it as the riverso to the leg then parry combination, I’d always get hit in the head by the opponent slipping out of the blow. Going back to reread the instruction I had the thought that if it’s a fresh sentence it might be a new action instead of a continuation of the previous one so I tried it as the direct countercut using mandritto falso. The action of touching the face of the buckler with the false your sword from Guardia Alta is also described at the start of the First Assault, which had me thinking it might be corroboration of the action. To my surprise it works and works reliably with devastating results. Where previously I’d been fouling on the opponent’s buckler, getting hit etc, I was now hitting without being hit. So currently my hypothesis is confirmed by empirical data, and as a scientist I accept the validity of the my current theory regarding the technique and it’s interpretation because the testing data (ie I don’t get hit and they lose a hand) hasn’t thrown up any conflicting data to the theory. Thank you for asking, because if we don’t ask the questions and challenge the assumptions we’ll never refine the interpretation. That makes sense. Thanks for the answers Richard. I’ll have to give that falso cover a try. I always thought the purpose of the entering sequences was just to look pretty. Sometimes I feel like these sequences don’t describe static starting positions, but that they have to be thrown as your opponent is moving into that guard. Especially the single blow “sequences”. I have thought this before, and your comment about how the riverso to the leg only really works if you feint a mandritto beforehand to draw their weapons up triggered it again.